For the first time in five years, existing home sales have increased for four months in a row, according to an August report by the The National Association of Realtors® (NAR). 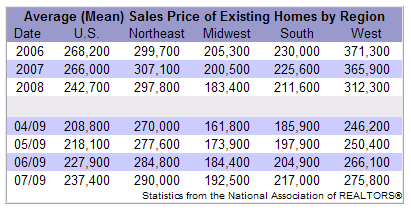 Existing home sales - including single-family, townhomes, condominiums, and co-ops - increased 7.2 percent in July, which is the largest monthly sales gain recorded since 1999. Analysts are projecting an increase in 2009 of existing home sales to a seasonally adjusted annual rate of 5.24 million units, which is 5 percent above the 4.99 million-unit pace set in July 2008. Freddie Mac reported that the national average commitment rate for a 30-year, conventional, fixed-rate mortgage dropped to 5.22 percent in July from 5.42 percent in June. This is a dramatic rate reduction compared to the 6.43 percent rate available in July 2008. According to a survey by NAR, first-time buyers accounted for 30 percent of homes purchased in July, while distressed homes accounted for 31 percent of transactions.